More fun in the sunny South. 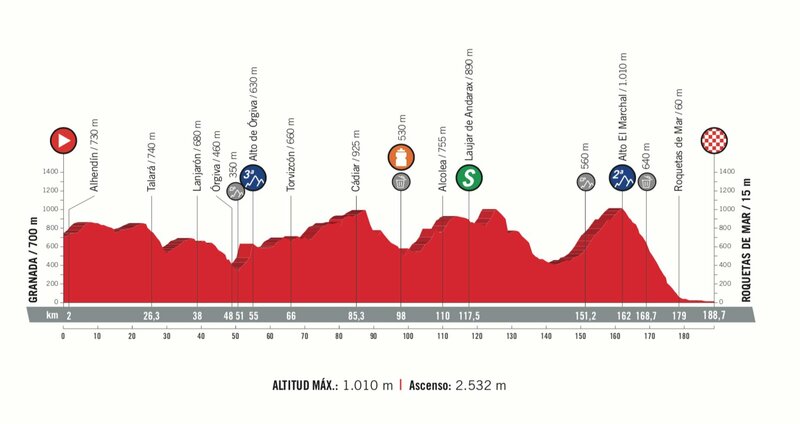 The official road book claims we have 2532m of climbing, in reality it is over 3000m. 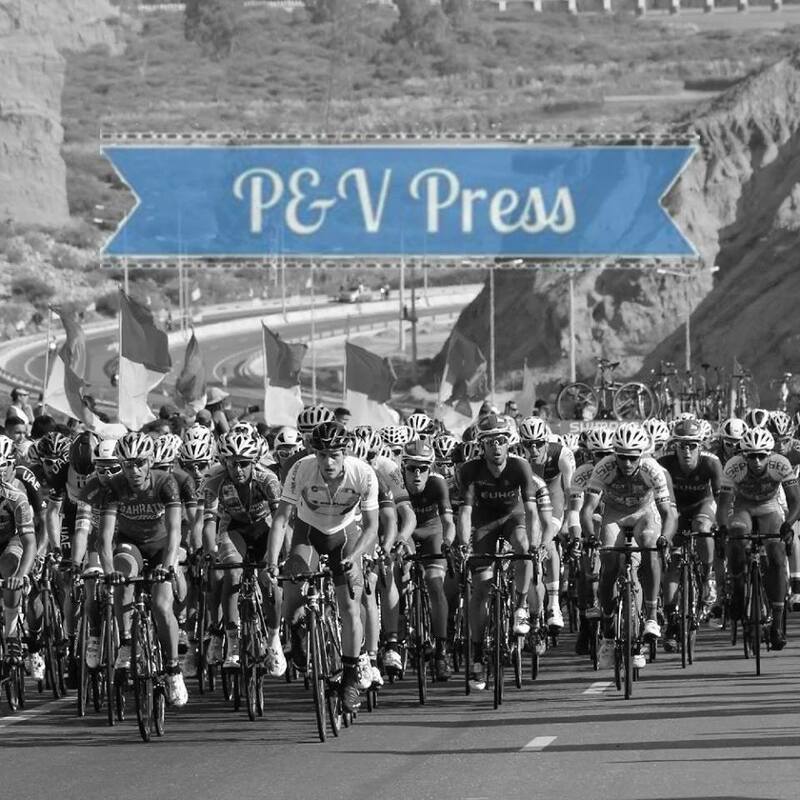 Classic Vuelta road book! 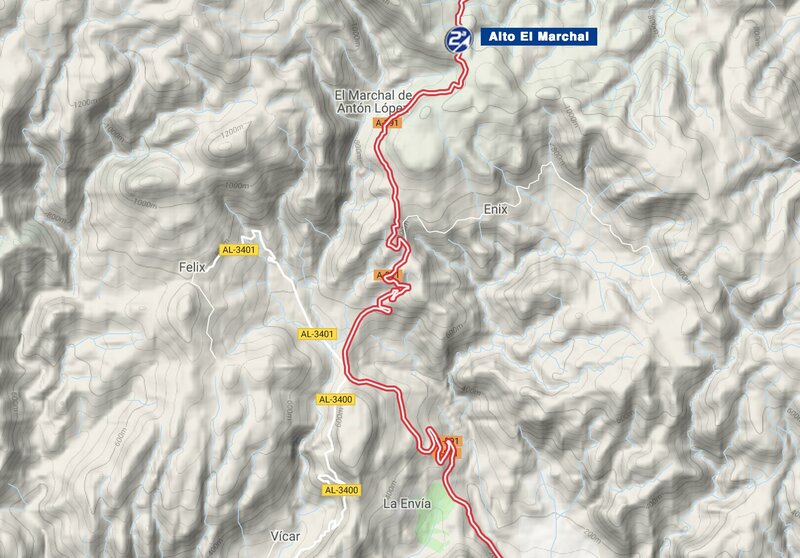 Despite just two categorised climbs, this is a tough day for the sprinters. 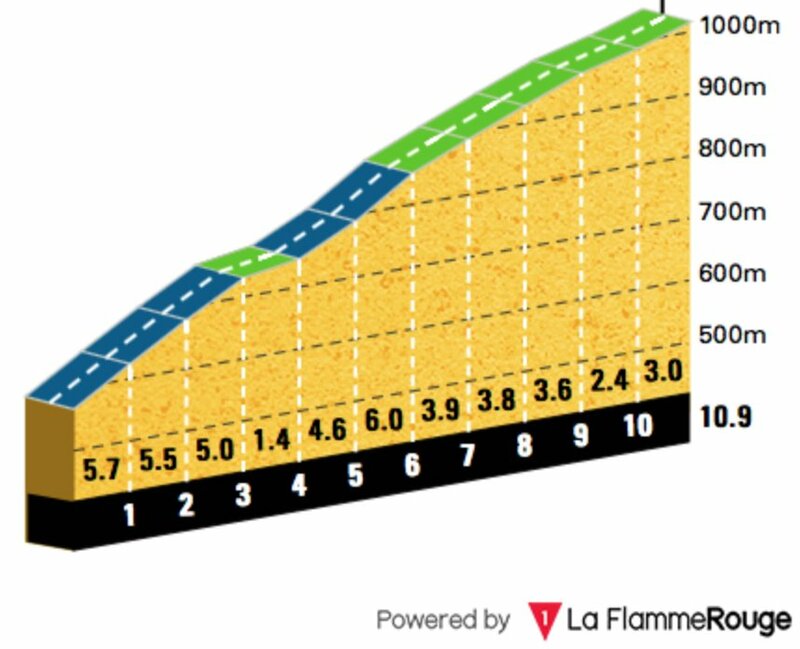 The final climb crests with 26.7km remaining and is 10.8km at 4.1%. Given how the peloton are racing these climbs, the sprinters have no chance of hanging on for a sprint finish. That then pushes the burden of chasing the break over to the GC teams. Will Sky chase for try for a stage with Kwiatkowski? Will Movistar chase and try to set up Valverde? Bala sits 12 seconds behind, which makes it almost impossible to take the red jersey. I don’t see Movistar wasting energy chasing the break. That means one thing, another great day for the breakaway! Today there wasn’t a battle to make the move, something that a lot of riders will have been disappointed with. This stage is sure to see a fierce battle to make the morning move, there is a stage to fight for. Once in the move, the final climb will be decisive. Not overly difficult, but certainly not easy. The length of climb will make it selective and provide a launchpad to escape and solo to victory, but there is still a far way to go from the top. There are a few technical points on the descent, perfect for those who like to take chances. It is possible to gap your rivals and head into town for a win. 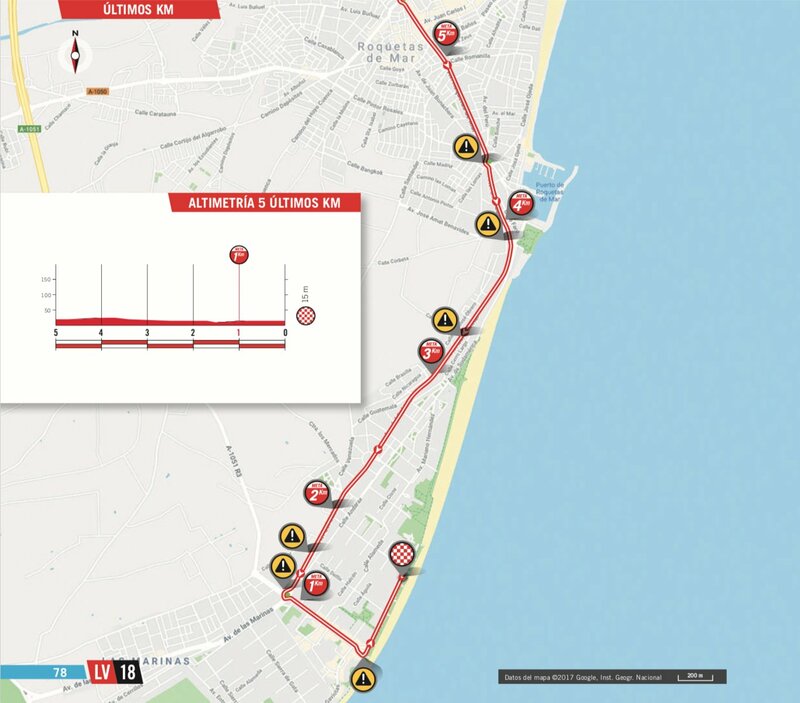 If we get any type of sprint, you need to be near the front for the final turn, which comes with 400m to go. Still very hot and the wind shouldn’t be an issue. Alessandro De Marchi – big engine, big motivation, big team. Already has two wins in the Vuelta, a third would be lovely! Omar Fraile – just about a perfect stage for Fraile. Could he possibly take a stage win and complete his grand tour set. That would be a monumental achievement for the ex-Caja Rural rider. Thomas De Gendt – standard De Gendt pick. Nelson Oliveria – Movistar will be keeping one eye on the team classification, they always do. He was 2nd to Gougeard back in 2015, something that probably still hurts him. He has all the skills required to make the break and can climb pretty well for a TT rider. Pieter Serry – if a big break goes, you know that QuickStep will be present. With the stage being too hard for Viviani, it could be the perfect time for Serry to take his first pro win. A loyal domestique, his win would be very popular with the Wolf Pack. Gianluca Brambilla – lost substantial time today, freeing him up for a raiding mission. The Italian is unlikely to win a mountaintop finish, a rolling stage is much better for him. Steve Cummings – not him again! Dead last or first, take your pick. Simon Geschke – excellent current form, he should be given free licence with Kelderman tucked away in the bunch. 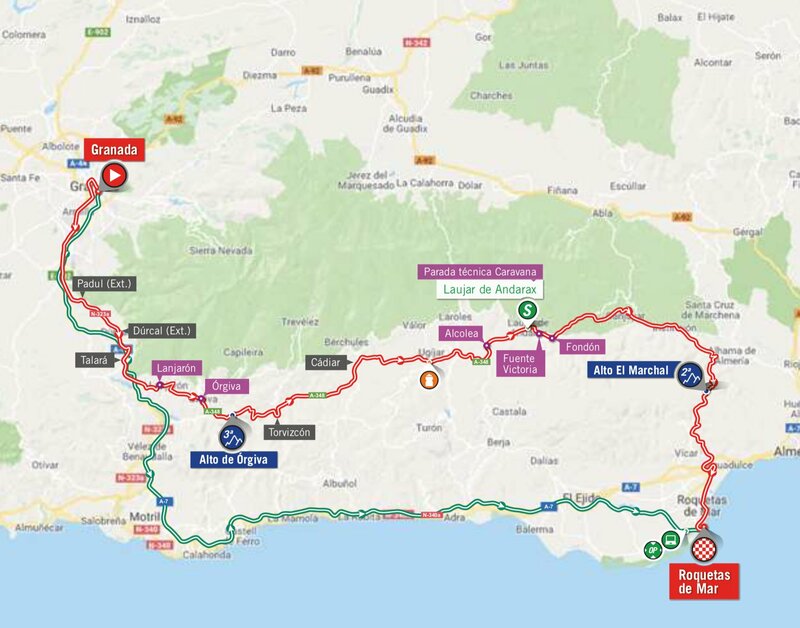 Alejandro Valverde – given the way he sprinted on Sunday, Bala looks a shoe in for the win, if we get a reduced sprint. To make it happen, Movistar will have to work their socks off. The break wins, I just can’t see any team motivated to chase. From the break, I think we’ll see Alessandro De Marchi taking another Vuelta win.